Welcome to our guide to buying property in Malaga. This 4-part guide takes a look at the Malaga property market and the 3 main areas in Malaga of interest to foreigners thinking of buying property in the city – the centre, the east side and the west side. General statistics about the Malaga property market, holiday lets and tourism. A snapshot of the area, its attractions and amenities. A list of advantages and disadvantages of each area. A quick guide to what’s on the market and an idea of prices. 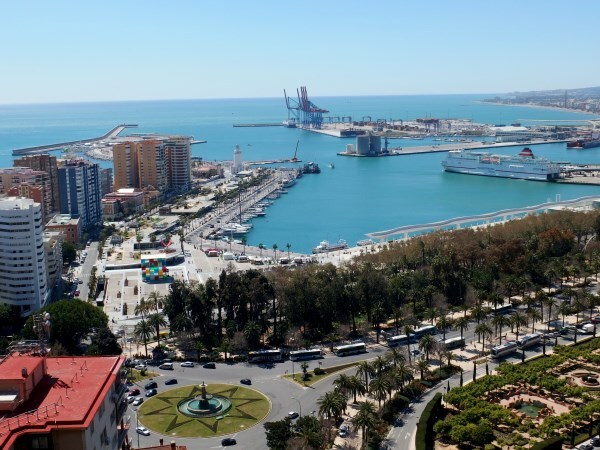 Until a few years ago, most Costa del Sol holidaymakers never visited Malaga city itself despite the fact that it’s the capital of the Costa del Sol and Spain’s 5th largest city. However, the new attractions in Malaga have reversed this situation and Malaga is now one of the top city-breaks in Europe with ever-increasing visitor numbers. In tandem with this increased popularity of Malaga as a holiday destination goes a surge in interest in the property market. Activity in the Malaga property market is currently one of the strongest in Spain and sales in the province in Q2 this year were the fourth highest in the country. Within the province, Malaga city is moving at a different pace to other localities. 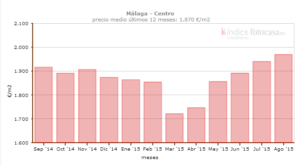 According to a report by TINSA in June this year, property prices in Malaga rose by just 0.06% between Q1 2014 and Q1 2015. In nearby resorts, however, prices fell – for example, property in Marbella dropped by 3.68%, by 2.31% in Fuengirola and by 8.42% in Mijas. Benalmadena was the only other nearby market to see price increases (1.42%). Within Malaga itself, the property market appears to be stable generally. Statistics from Fotocasa (one of the largest online property portals in Spain) for the whole of Malaga city show that prices went up by just €5 per square metre between September 2014 and August 2015. In the graph below, you can clearly see the signs of a stable market with prices barely fluctuating from the €1,624 per square metre registered in September last year and the €1,629 in August. Property in Malaga city centre tells a slightly different story. Here, prices rose by nearly 3% in the 12 months between September 2014 and August this year, and the square metre price (€1,970 in August) is considerably higher than the city average. Since the opening of the Picasso Museum over 10 years ago, tourism in Malaga has gone from strength to strength and city tourism officials are expecting record visitors this year. Figures for July show that nearly 10% more tourists visited Malaga than the previous July. International visitors increased by 12.8%. Malaga saw the third highest increase in Spain after Bilbao and Valencia. During the 7 months between January and July, over 616,000 tourists visited Malaga, a 4.94% increase on the same period in 2014. The city registered the third longest average stay in Spain after Mallorca and Barcelona. The graph below shows the gradual increase in monthly visitors to Malaga over the last 6 years. The city has seen a huge rise in both the popularity and number of holiday rentals over the last 18 months. According to Niumba/TripAdvisor, holiday lets in Malaga this year rank as the 12th most popular in Spain and the 70th in the world. During Malaga Fair Week this year (15-22 August), the city was the 3rd most popular destination for holiday let destinations in Spain and 5th in the world. Another holiday let portal HomeAway reports that demand for holiday lets in Malaga province rose by 7% this summer and accounts for 25% of demand in Spain. A report compiled by EY, Nielsen and Tourism&Law found that Malaga has the 4th highest number of holiday lets in Spain – 28,763 beds – after Barcelona, Madrid and Seville. For information about the process for buying property in Spain: Download FREE Guides to Spanish Property.